Who, as a little girl, didn't enjoy having tea parties? Wearing clothes from my dress-up truck and my mom's shoes, I could spend an afternoon pretending that I was a lady enjoying tea, wearing my "fancy" clothes and the company of my friends. As I got older, the tea parties stopped and only recently have I asked myself why. The art of a tea party has been lost on my generation, and to be honest, my mom's generation as well. Gone are the days of a ladies tea parties, replaced by happy hours, cocktail parties and networking receptions. My grandmother's generation was truly the last to host these timeless events, with proper china cups, dresses and gloves, with a little formality and a lot of beauty. It was a way to learn about your fellows and exchange recipes, use good manners and refine the art of conversation. 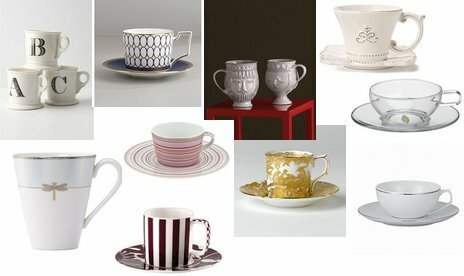 But somewhere along the way, tea cups were replaced by wine glasses, Chamomile for chardonnay and tea pots for beer pints. What was once a time honored tradition, one that had no time limit, was replaced by the ultimate time cruncher, the happy hour. So, how can we get back to taking a true interest in our friends and really enjoying the finer moments in our day? Some days, it's as simple as picking up the phone and calling, rather than sending a text message. On others, it's mailing a handwritten Thank You note, rather than sending an email. When you're hosting a party, send out a paper invitation rather than the Evite. And some days, it's truly as simple as drinking morning coffee or an afternoon tea out of a beautiful cup and matching saucer, rather than a mug. It's using the "special" dishes on a typical Monday night. While the tradition has been lost on the generation prior and also on mine, I hope that this is a tradition that I can pick-up in my "grown-up" years, relight the torch and pass on as heritage to my daughter. I like not only the idea of the tea party, but also the historical perspective of a gathering of women. It's time together to share laughter, ideas and memories, but most important of all, it's a time to listen to the stories that each woman brings to the table of their own history.